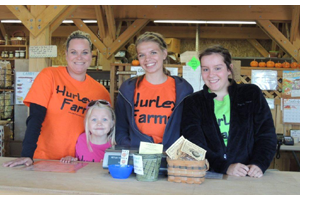 When you walk into the Hurley Farm facility you’ll be greeted and served by our friendly, knowledgeable staff, who are excited to help you provide healthy, high quality meals for your family and friends. Hurley Farms is committed to providing homegrown, fresh, and local produce – only the best products, all in a family-owned and operated business. Originally founded as Wickerham Produce by Wayne and June Wickerham in 1968, the produce business has always been a part of their youngest daughter LeaDel’s life. After Wayne’s retirement from the produce business in 1996, LeaDel and her family decided to reopen the produce market in 1998. Today known as Hurley Farms, it is owned and operated by Russ and LeaDel Hurley, along with their youngest son Dan and his wife Kristin. In their first year they began with only 0.5 acres of sweet corn and tomatoes. Over the years, the vegetable production has expanded to 25 acres of sweet corn and 15 acres of various vegetables; including pumpkins, ornamental squash, and gourds. Russ studies the seed catalogs and orders supplies in December while Dan gets the greenhouse ready for a new season. After the seeds arrive Dan gets busy in the greenhouse planting the first cabbage in early March. By the end of March Dan is geared up to start the 10,000 tomato plants they will set out as soon as weather permits. Dan and Russ plant the first sweet corn in early April or late March (assuming Mother Nature is cooperating). If everything goes well they hope to pick sweet corn by July 4th. Most years Mother Nature does not support their cause. While Russ and Dan are busy in the fields, LeaDel and Kristin are busy managing the store. Kristin takes care of the work schedules, product orders and payroll. LeaDel also orders product, coordinates deliveries and takes care of advertising. Hurley Farms hires anywhere from six to twelve high school and college students to help with the retail operation, field work, and harvest. Some days you’ll even find Dan and Kristin’s children, KayLee and Tanner, helping in the store or warehouse. 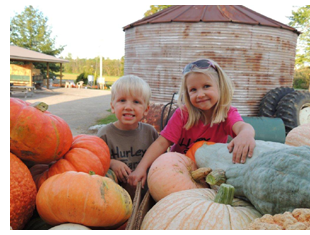 They hopefully will become the 4th generation in the Hurley Farm produce business! Hurley Farms is definitely a family affair. LeaDel’s sister Cindy, who helped start Wickerham Produce, is always the first to open and doesn’t mind taking orders from her “little sister”. Wayne can be found almost every day of the week on the lawn mower and lots of times in his truck making a delivery or picking up an order from another grower. June keeps busy in the kitchen preparing Dan’s favorites for lunch and making breakfast sandwiches on mornings the guys have to eat “on the run”. Work typically begins around 6:00 a.m. with a quality control check on all items, then getting orders prepared for the day. Handling produce around the clock is common during the peak harvest seasons. Everything from sorting to packing may be done through the night to prepare for an early morning shipment. Long days are part of the fun and excitement here at Hurley Farms. Over the past several years, Hurley Farms has added to their Special Events featuring the ever-popular “Peach Sundaes” where you are encouraged to ‘Come to the country to enjoy a Sundae on Saturday! Learn more about this upcoming summer event by clicking here. Another popular event every year at Hurley Farms is Apple Fest, held in September. This is when you can get your fill of homemade ice cream, apple dumplings, chicken and noodles for a delicious Fall treat! Learn more about Apple Fest, click here. Pumpkin Fest is THE event of the season – a great fun-filled family time that offers plenty of games for everyone to enjoy. Be sure to check out more about this event by clicking here. This year, you can order or shop for delicious cuts of meat, cheese and other deli products that will have your family saying “more please!” To see pictures of our newest addition to Hurley Farms, click here and check out the "Lea Deli," named after Lea Del Hurley and featuring only the finest local deli products! From our family to yours, we take great pride in offering fresh, local and tasty produce! Subscribe to our Hurley Farms e-newsletter for special offers and updates on produce! Click Here Now.